A big problem with designing cities around cars is that motor vehicles are big and bulky and take up a ton of space. And the more space you give to cars, the greater the pressure to cede even more territory — to park vehicles and transport all the additional people who no longer find it appealing to walk, bike, or take transit in a more spread-out city. Parking garages and lots aside, many streets have been engineered to allow for faster vehicle travel at the expense of people riding bicycles and walking. The result is a less safe and less pleasant environment for non-car transportation, increased pollution, increased wear and tear on roadways, and increased congestion on those bigger and faster roadways. Conversely, streets with narrower (and sometimes fewer) travel lanes, added bike lanes, properly priced parking, and strong pedestrian infrastructure have positive effects on sustainability and community vibrancy. One way of measuring the walkability in a community is by comparing the amount of paved roadway to the amount of space for buffer strips and sidewalks. 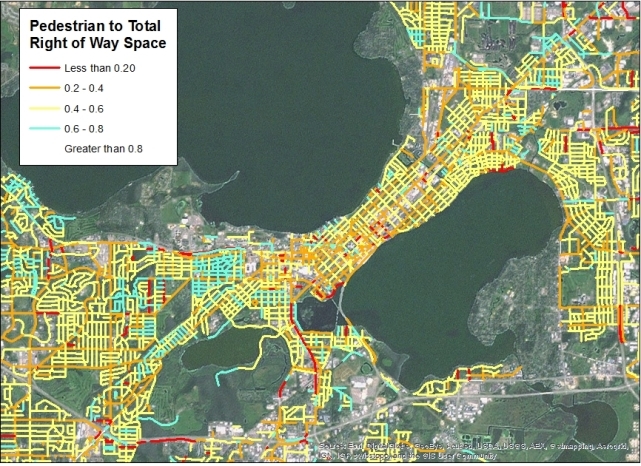 In Madison, Wisconsin, we used a database of street information and aerial imagery to depict the ratio of pedestrian space to total right-of-way on all the city’s streets. Obviously, the space allocated to pedestrians is only one of many metrics by which we can evaluate an area’s livability and sustainability. However, using increasingly high-quality data to analyze land use patterns and infrastructure priorities can help us identify areas where targeted improvements to the pedestrian experience can make the biggest difference for communities. Elsewhere on the Network today: Streets.mn feels optimistic about the future of Minneapolis following this week’s mayoral and city council elections. The Bike League says federal agencies are starting to show some leadership in bike-friendliness. And Transitized uses visual representations to show the proportional cost of some transportation projects in the Chicago regions. Guess which ones eat up most of the money.